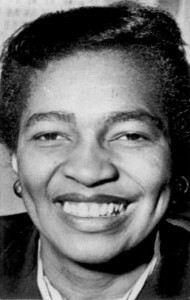 Claudia Jones was born in Trinidad in 1915, emigrated as a child to America. There she became a political activist and after becoming a communist was deported and came to Britain. She then set up the first black newspaper, the West Indian Gazette, in 1958. She is also known for helping to set up what became the Notting Hill Carnival. When she was born, Trinidad was still a British colony. She moved to Harlem in New York when she was eight but contracted TB which resulted in her damaging her lungs and suffering heart disease. She lived in New York until she was deported in 1955. During that time she became involved in black activism through the Communist party and was also a journalist with the party’s paper, The Daily Worker. In 1948 she was arrested for the first time and sent to prison. Three further spells in prison followed and after the last she was deported to Trinidad which refused her entry. Britain however granted her asylum. Once in London, she became a leader in the emerging Black equal rights movement. Many West Indians suffered from prejudice in housing and employment and then, there was no legislation making it illegal to discriminate on the ground of colour. The West Indian Gazette was the first newspaper to provide an opportunity in the media for discussion of civil rights and printed news that was not covered in the mainstream media. It also provided a platform for talented black writers who would have gone unpublished otherwise, in many cases. One of the things she is best known for is the Notting Hill Carnival. It was a response to the riots in 1958 when a racist mob attacked local residents. Drawing on the West Indian tradition of carnival, she intended that the event would help to bring local communities together. The first carnival was held in January 1959 in a local hall. By the early part of the 1960s her health was failing badly but in spite of this she organised campaigns against the immigration legislation of 1962 making it harder for non-whites to migrate to Britain. She also campaigned for the release of Nelson Mandela.